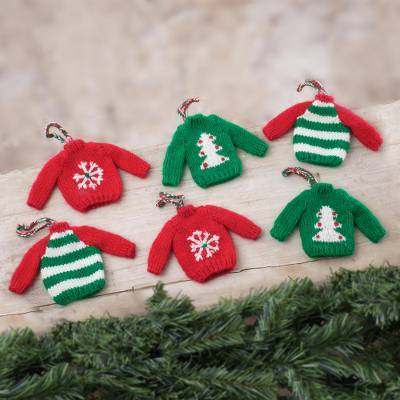 Knit Mini Sweater Ornaments from Peru (Set of 6), "Christmas Comfort"
These are the cutest Christmas ornaments online! Super delicate, sweet, and fun! “I am Leonor Martinez. I was born in the historical capital of Cusco, formerly the capital of the Inca Empire. It was one of the most important cities of the Viceroyalty of Peru; and in the hands of the Spanish, it was adorned with churches, palaces and Baroque and neoclassical squares. It is beautiful everywhere you look. “I am a very sociable woman, and a cheerful and positive worker. I trust that tomorrow always brings us new opportunities to be able to move forward. “Like everyone, I had very difficult times as a child. I did not grow up with my biological parents, but a warm and loving family welcomed me into their home and made me part of it. Thanks to them I was able to grow and not feel any emptiness. On the contrary, I think for some reason God put these good human beings in my way, so we could overcome adversities together. “Since I was little I was always curious and always ready to learn. I consider myself self-taught par excellence. Everything I learned has been by watching and observing everything that other artisans did. I was aware of every detail, and when I arrived home I tried to imitate and improve, doing my own version of each job. “For me, knitting and embroidery is an art that is in the blood; it requires a lot of patience, good humor and dedication. This craft drives my creativity and leads me to develop more and more things. I have fun and I love it--there is nothing like doing something with passion and love. I dream of progressing as an artisan, teaching other people in my community and all those who want to learn how to knit--the doors of my home are always open. This art encourages me to develop the most difficult aspect of creation; to create physically what was previously only in my head. That fascinates me.